Hobbs Batting is THE BEST THERE IS. 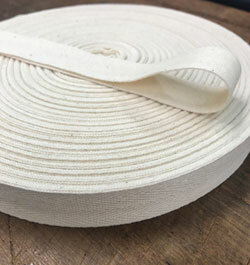 Hobbs Bonded Fibres has been committed to providing the best selection of batting's for over 35 years to quilters, quilt shops, craft stores and fabric retailers. 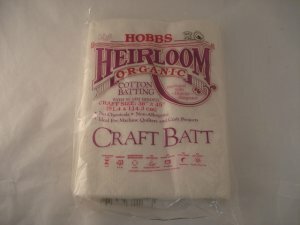 Hobbs Bonded Fibres manufactures the most complete line of quilt batting's, pillow inserts in packaged and roll forms. 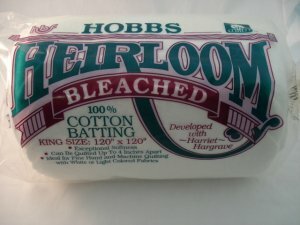 Hobbs Bleached. 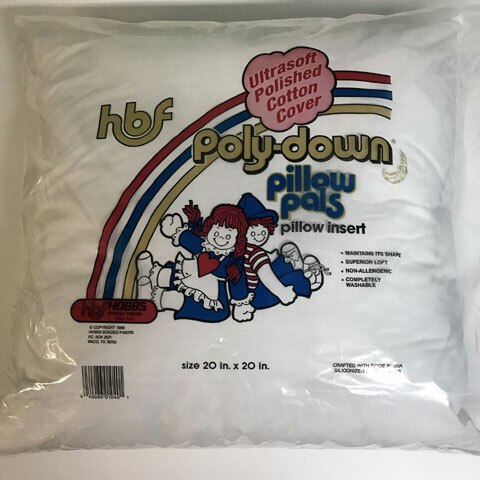 Made from the best cleaned and bleached cotton , it is needlepunched to make it easy to quilt, and can be hand or machine quilted up to 4 inches apart. Shrinkage is 3-5% and can be preshrunk for minimal shrinkage.  Is best used with white or light coloured fabrics. 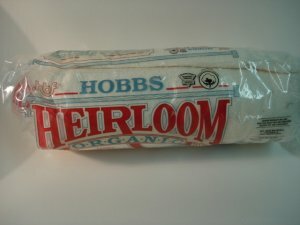 Hobbs Premium Heirloom 80/20. This was created at the request of Harriet Hargraves who wanted a dream batting for the quilter. It is very clean cotton mixed with 20% polyester, lightly needlepunched and resinated, has more loft than typical cotton batting and is easy to hand or machine quilt. It shrinks 3% (can be preshrunk to minimize undesired shrinkage)and can be quilted up to 4 iiches apart. 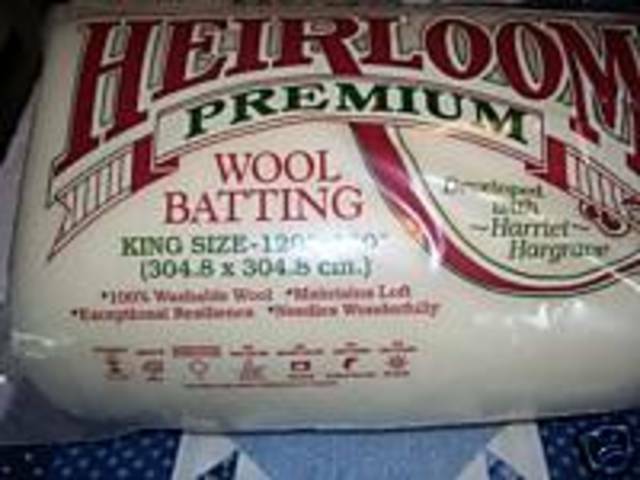 Hobbs Heirloom Wool Heirloom Wool Batting. 100% wool. Washable or dry cleanable. Resin bonded to reduce fiber migration. Can be quilted up to 3-1/2" apart. Excellent insulator and naturally breathes. Due to possible bearding, not recommended to be used with black fabrics. Endorsed by Harriet Hargrave, noted author, lecturer & quilter. 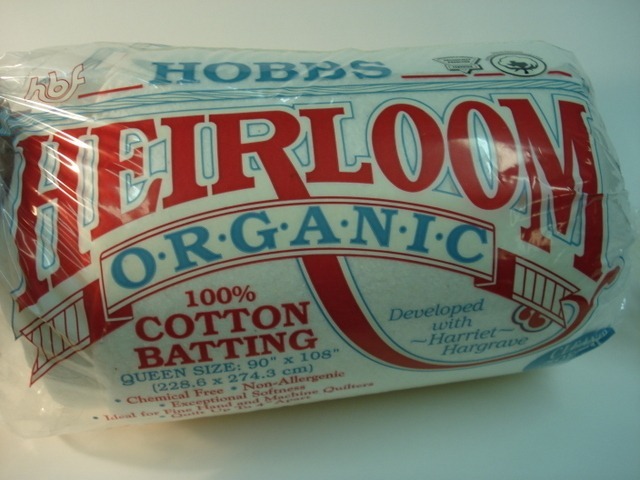 Hobbs Organic Heirloom 100% Organic Cotton. Packaged and by the yard (metre). 100% organic cotton, grown with no chemicals. Excellent for fine hand or machine quilting. 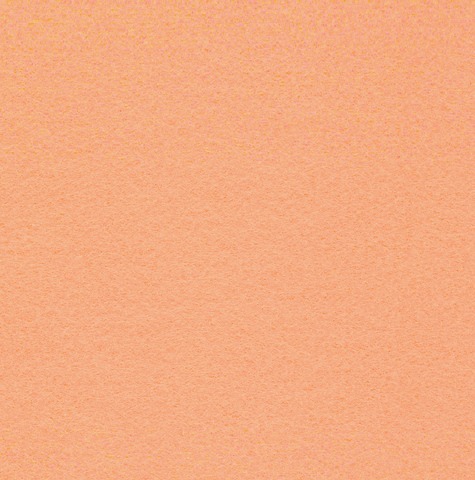 Provides antique look and is very clean unbleached cotton. All 100% unbleached cotton could show through or stain white or very light colored fabrics. Can be quilted up to 2" apart. Endorsed by Harriet Hragrave noted author, lecturer & quilter. 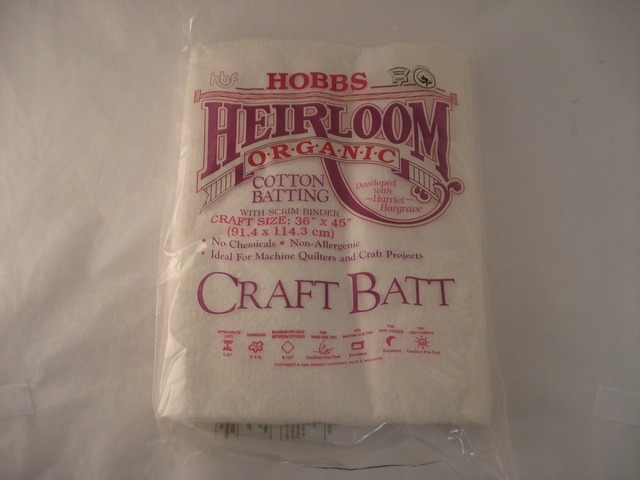 Hobbs Organic/Scrim Heirloom Organic with Scrim Binder. 100% certified organic cotton exclusive of scrim binder. Excellent for machine quilters and crafts, much easier to hand quilt than most other cottons with scrim. Can be quilted up to 8-10" apart. 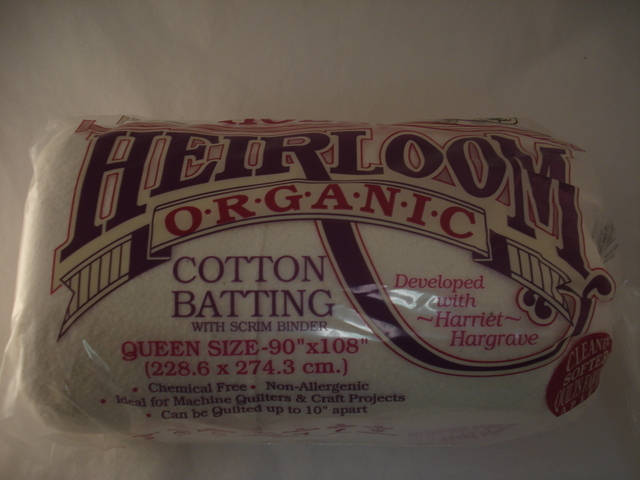 Provides antique look and is very clean unbleached cotton. 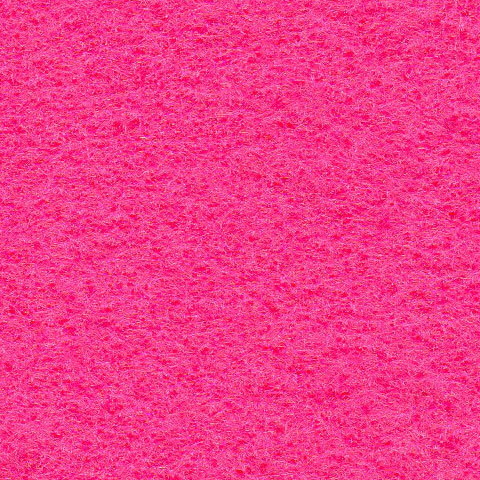 All 100% unbleached cotton could show through or stain white or very light coloured fabrics. Endorsed by Harriet Hargrave, noted author, lecturer & quilter. Hobbs Pillow Inserts See Cushion Inserts Pillow Inserts on the Products List. Hobbs Thermore Thermore. The ultimate batting for fine hand or machine quilting. Patented process that eliminates fiber migration. 100% Polyester (siliconized). Ultra low loft for clothing, Wallhangings, Miniture Quilts and fine quilts. Hollow fibers act as better insulators. Can be quilted up to 12" apart.